I LOVE Korean food. One of my dreams is to visit Korea and do a food tour there. Alas, I haven’t made it there yet but a dear friend of mine is letting me live vicariously through her. 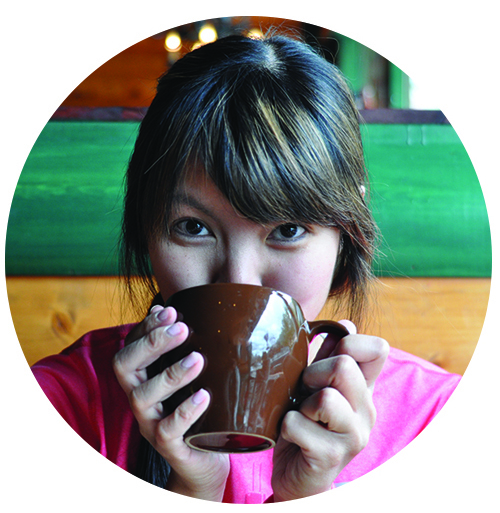 Gina moved to Korea just under a year ago to teach and she was kind enough to write a guest post for Girl Eats World that is “All About Korean Food.” Thank you for this scrumptious post, Gina! When it comes to picking a place to visit in Eastern Asia, it seems like the most popular destinations of choice are almost always Japan or China, but never South Korea. Many people are familiar with sumo wrestling and The Great Wall in Beijing, but South Korea? What does it have to offer? After teaching English in South Korea for almost a year now, I’ve made all kinds of new, awesome discoveries about the over-looked country: the locals are friendly, it’s affordable to live here, and there’s a lot to do for fun, but my favorite discovery of all? The cheap and delicious food. When learning about Korean food, the first food you need to know about is kimchi: a fermented cabbage that has been prepared with a variety of seasonings that make it spicy. Kimchi is a traditional Korean dish that is served with every meal because it’s healthy and it helps to improve digestion. There are different variations of kimchi, such as kimchi made with cucumber, radish, or green onions. 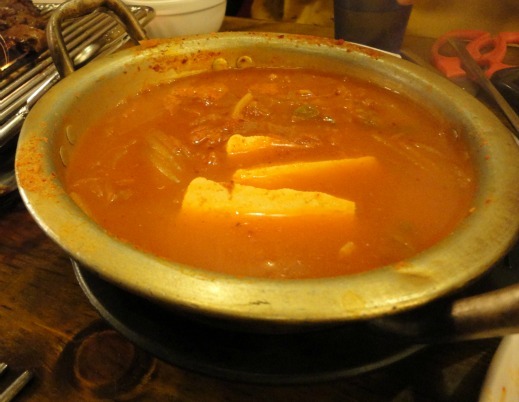 Kimchi can also be used as the main ingredient for Korean dishes, such as kimchi chigae (kimchi soup) and kimchi bokkumbap (kimchi fried rice). kimchi chigae (kimchi soup)When people who are actually familiar with Korean food think of Korean food, it’s likely that Korean BBQ is the first thing that comes to mind. 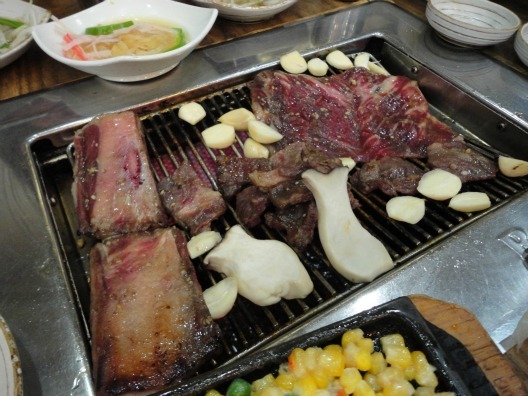 Barbecued meats are definitely a huge part of Korean cuisine. There is a wide variety of meats that Koreans like to barbeque (e.g. pork, duck), but the most popular meat is galbi: a meat dish made from marinated beef short ribs served with a side of lettuce which is used to wrap the cooked meat. 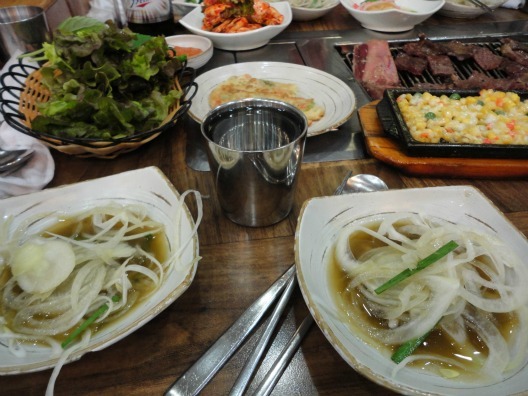 Galbi is typically served in “galbi houses” where the guests sit at a table with a built-in grill and cook the meat themselves. The galbi and lettuce are served with an assortment of side dishes, like salads, vegetables, and of course, kimchi. And the best part about these side dishes? They’re free and you get unlimited refills! galbi table with condimentsMy absolute favorite kind of galbi is called dalk galbi. It consists of small pieces of chicken, vegetables, ddeokbokki (mini rice cakes), and a spicy sauce all cooked together, which results in glorious, spicy deliciousness. dalk galbiBarbecued meats may be a popular part of Korean cuisine, but there are plenty more yummy Korean foods to choose from. Now I want to give some examples of Korean fast food: Korean food that’s fast, cheap, and not necessarily healthy, but oh-so-mashisoyo (“mashisoyo” means “delicious” in Korean)! In this category, some of my favorites are gimbap and ramyeon. Gimbap looks very similar to sushi, but the ingredients differ slightly: vegetables, kimchi, cheese, fish, or meat wrapped in rice, which is then wrapped in seasoned seaweed. Ramyeon, or ramen, is another staple food of quick, Korean cuisine. When you order ramyeon at the little Ma ‘n Pa restaurants, the possibilities are endless: ramen with kimchi, fish, cheese, etc. My favorite kind of ramyeon is actually cheese ramyeon; it’s kind of like the macaroni and cheese of Korean food, but it has a spicy taste to it. ramyeon and gimbapSome more of my favorites in this category are mandu and bibimbap. 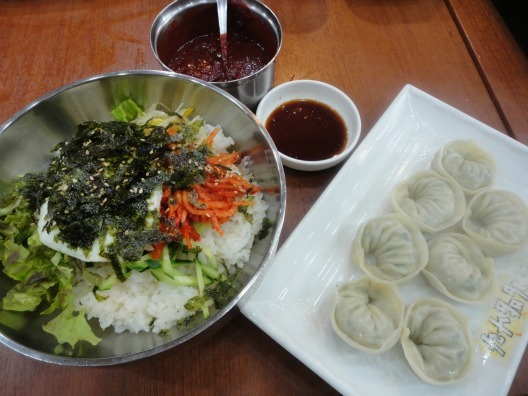 Mandu has the exact same concept as Chinese pot stickers: a dumpling filled with anything from pork to kimchi and served with a dipping sauce made of soy sauce and vinegar. If you’re looking for something quick and cheap, but somewhat healthier, you should try bibimbap. I like to think of bibimbap as a Korean salad because it includes lots of veggies, but also rice, a raw or fried egg, and a spicy chili pepper paste. It’s an interesting combination, but surprisingly good and filling, too. bibimbap and manduThese are only some of the amazing Korean foods I’ve tried and grown to love in the past year. I could go on, but I think the best thing to do at this point is to stop reading about it and go try it! If you’ve tried Korean food once or twice before, I hope you find this post useful in finding new, delicious Korean foods to try. And if you’ve never tried Korean food before, be prepared to think “Where have you been all my life?” when you finally do try some dalk galbi or bibimbap. It might even be love at first bite! That’s how amazing Korean food is.